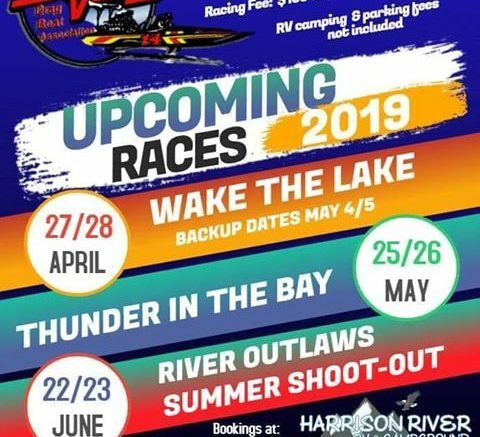 Harrison/Maple Ridge – The Fraser Valley Drag Boat Association has announced their 2910 schedule of races . Last year was their first race in 18 years and it was a blast. Three more events are planned for this spring and summer. The association are holding a fundraiser to raise funds for Safety Equipment and a Timing System for their club, the Fraser Valley Drag Boat Association. That is coming up on Sunday, March 24th, 2019 – 1:00 pm at The Caddyshack Show Lounge in Maple Ridge. !!!!!!!!! !Well it’s Contest time !!!!!!!!!! !Like our page and share this post and tag 2 friends. Winner of the draw march 16th will win the following ..*Fraser Valley Drag boat key chain*Fraser Valley Drag Boat koozie*Fraser Valley Drag Boat sunglasses*Fraser Valley Drag Boat t-shirt or tank top (winners choice)* 2 tickets to the FVDBA fundraiser at the Caddy Shack in maple ridge March 24th 1pm-8pm this includes a burger and a beer or drink For each ticket. Estimated give away package value at over $125 !!!!! 1. Like our page fraser valley drag boat association -official2. Tag 2 friends in the post3. share !!!! !4 Draw for winner March 16th 2019 9pm See u at the fundraiser !!!!! The 2019 schedule is below. For more information you can call Jessika at 778-834-8757 or Shauna Khunkhun at 604-813-1050. The Facebook page is here. 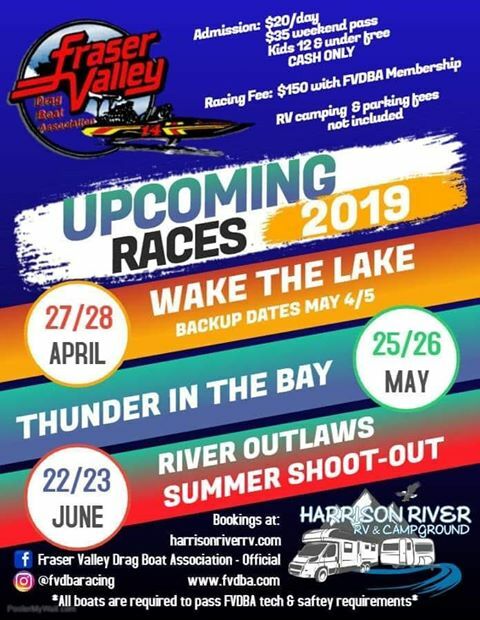 1 Comment on "Fraser Valley Drag Boat Association 2019 Schedule And Fund Raiser – Sunday March 24 (VIDEO)"
Hi where do you race ,Harrison lake or?